Caveat Fuzzy is, depending on how you look at it, the fifth or seventh novel in the “Fuzzy” series started by Little Fuzzy by H. Beam Piper. Piper wrote novels 1 and 2, Little Fuzzy (January 1962) and Fuzzy Sapiens/The Other Human Race (June 1964), and committed suicide. There was a long hiatus while Piper’s semi-legendary third “Fuzzy” novel was searched for. In the interim, William Tuning wrote the approved 3rd novel, Fuzzy Bones (December 1981); and Ardath Mayhar wrote the 4th, Golden Dreams: A Fuzzy Odyssey (October 1982). Then the lost manuscript of Piper’s Fuzzies and Other People (August 1984) was rediscovered, which directly contradicted basic plot elements of Fuzzy Bones and Golden Dreams, so those were declared non-canon and Fuzzies and Other People was recognized as the legitimate novel 3. More than twenty years went by, and Fuzzy/Piper fan Wolfgang Diehr wrote a fan novel, Fuzzy Ergo Sum (March 2011) that was so well-liked by the Piper estate that it was published as novel 4. 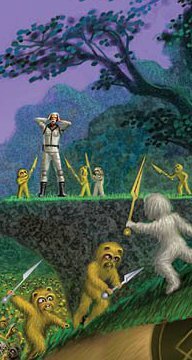 However, while the previous “Fuzzy” novels had been self-contained, Fuzzy Ergo Sum ended on a cliffhanger with much of the story still to come. Caveat Fuzzy (August 2012) is that sequel, novel 5. Boalsburg, PA, Pequod Press, August 2012, hardcover $36.00 (394 pages), Kindle $7.99. Or novel 7, for those who don’t accept Fuzzy Bones and “Golden Odyssey” having been declared illegitimate. Or novel 6 or 8, for those who include John Scalzi’s Fuzzy Nation (May 2011) as part of the series. Or as part two of Fuzzy Ergo Sum for those who consider Fuzzy Ergo Sum and Caveat Fuzzy to be a single novel unnecessarily split in half. Whatever. The one thing that is certain in this is that Fuzzy fans will be pleased by the appearance of Caveat Fuzzy. The questions posed in Fuzzy Ergo Sum are answered satisfactorily. For readers who are not familiar with the first three novels, however, there may not be enough background material. New readers are advised to start with Little Fuzzy, which is available free on Project Gutenberg, and is still reckoned by many Fuzzy fans to be the best-written and most enjoyable in the series. And reading Caveat Fuzzy without having read Fuzzy Ergo Sum first is like starting a novel in the middle. Fuzzy Ergo Sum starts about two years after the events in Little Fuzzy. The childlike golden-furred small natives of the planet Zarathustra, Little Fuzzy and his family and tribesmates (who are why these novels are considered anthropomorphic), have been “benevolently protected” by the new Terran Federation human planetary government of Zarathustra. An offworlder, John Morgan, comes to Zarathustra for mysterious reasons. An illicit sunstone mining operation in an unexplored area of Beta Continent has a run-in with a tribe of Fuzzies who have not yet encountered humans, setting up a potentially violent conflict. At least one, and apparently more, organized criminal groups in the capital city of Mallorysport have plans to destabilize and/or take over the shaky new Zarathustra government, ousting the Fuzzies’ protectors and leaving them open for exploitation. An archaeological find of the remains of a buried prehistoric spaceship brings up the possibility that the Fuzzies are not native to Zarathustra, but are the descendents of ancient marooned space travelers. It was a tall cliff on which to end the story in the middle. Caveat Fuzzy begins without a synopsis, which is the main reason this “novel” reads like a straight-on continuation of Fuzzy Ergo Sum. The Good Guys – Jack Holloway, Gus Brannhard, Bennett Rainsford, Victor Grego, Leslie Coombes, Max Fane, and their friends -- try to conduct their personal life toward Happily Ever After goals and their public life toward what is best for both the human colonists on Zarathustra and the native Fuzzies, while the criminal gangs work to defeat each other and take over Zarathustra’s fledgling political scene, attacking the Good Guys on the influential B.I.N. television network as corrupt scoundrels and outright criminals who should be turned out of office. The “Fuzzies as Ancient Astronauts” question divides the scientific community, or is made to seem to. John Morgan’s personal goal of settling unknown interstellar refugees into an out-of-the-way corner of Zarathustra is revealed but is politically risky. Most dangerous of all, the interaction between the wild Fuzzy tribes and greedy and criminal humans leads to a Fuzzy leader, Red Fur, to unite all the Fuzzies who are not familiar with humans to kill them or drive them off Zarathustra. 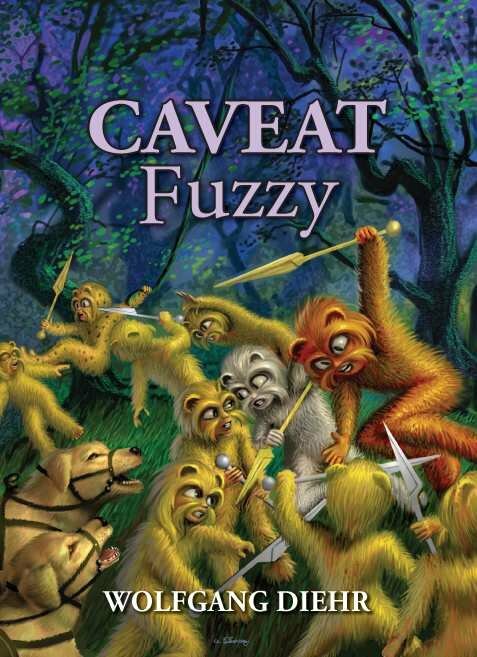 Jack Holloway and the others are horrified; while the savage Fuzzies cannot win, the conflict would result in the needless deaths of many Fuzzies and the possible permanent hostility among the Fuzzies between those who support Fuzzy-human friendship and those who oppose it. This conflict is shown at its most violent on Alan Gutierrez’s attractive wraparound dust jacket. Fortunately (I hope readers do not mind a minor spoiler), things work out with a minimum of bloodshed and there is a Happy Ending. In fact, the major complaint against Caveat Fuzzy (aside from it being only half a novel) is that everything is too neatly wrapped up. Where Fuzzy Ergo Sum had too many loose ends, Caveat Fuzzy leaves none at all. This is possibly wise; after 4? 5? 7? novels in the series, it’s nice to have a final conclusion. Full disclosure: in the Acknowledgements on the next-to-last page, Diehr thanks me as one of his editorial team. I proofread “Caveat Fuzzy”.